In the grand scheme of things, an event like Big Ten Media Days is more about doing quirky, outside-the-box stuff. One outlet wanted players to draw their head coaches, one wanted players to draw their dream alternate uniform. Coaches get some hard-hitting questions but the players (for the most part) have a pretty lighthearted go of things. The guys that have fun with it really have fun with it. In that spirit, let’s do some superlatives to put a bow on 2018’s Big Ten Media Days. Brandon Vogel has his annual coach tie rankings and that concept alone is, objectively, awesome. We’ll try not to step on any toes here and focus on who amongst the players was dressed the best; we’re not stopping at ties. Suit game encompasses everything: jacket cut, socks, pins, pocket squares, watches and shoes. The guys that just wake up, throw on a plain navy blue jacket and stroll out the hotel door aren’t going to do well here. No. 1 Maryland offensive lineman Derwin Gray: This one didn’t pop up until midway through the second day, but boy did it stand out. Gray took all the chances with his Media Day attire and he gets high marks for that. The outer shell on its own is plain but it has to be to compliment all the noise underneath. Gingham and polka dots is a cool combo to pair if you do it right and Gray does. He’s got just the right amount of flash with the gold watch band and the shoes were probably the best things that touched the floor of that downtown Chicago Marriott hotel in a long time. No. 2 Nebraska wide receiver Stanley Morgan Jr.: This is not a homer pick, Stan the Man just looked dapper. Windowpane suits were in as a bunch of guys on Day 1 rocked them and everything about Morgan’s burgundy-on-black look oozed style. Again, just the right amount of shine here with another gold watch band to pair with the Huskers lapel pin. Not everyone can pull off the exposed ankle look. Morgan can. He’s also a sleek dude, so the slim-fitting suit and skinny tie work really well. No. 3 Penn State safety Nick Scott: Another windowpane over a white shirt with mismatched trousers. Where Morgan went solid and skinny with his tie, Scott pulled out the paisley. This is just a really good look. People keep forgetting about the socks. How do you forget about the socks? The second you sit down and the pant leg rises, nobody wants to see those nasty white tube socks or Gold Toe dress socks from Dad’s drawer. This one is not limited to players simply because a coach takes the top spot. No. 1 Minnesota head coach PJ Fleck: Fleck has a way of distracting you with what’s going on up top — be it the rapid-fire talking points or the always-loud suits — but when he sat down behind the podium and the socks were revealed… I mean, they have to be custom. Who’s selling U of M-colored socks with scattered Minnesota state outlines on them? And do they make them for other states? No. 2 Iowa defensive end Matt Nelson: Each of the three Iowa representatives had a plain blue suit with a plain shirt and a plain tie. Very Iowa. But Nelson stepped out of the comfort zone with pineapple socks and I commend him for it. I honestly think I might have the same pair. No. 3 Michigan State running back L.J. Scott: The man had palm trees on his socks. Next. HM: Striped socks. They were everywhere. Media Days was a big win for horizontal lines. You would think this would belong to Maryland considering they had the best-dressed player and another honorable mention. But it isn’t. The best overall team look belongs to Indiana. Timian, as mentioned, had a strong showing. Safety Jonathan Crawford wasn’t in IU colors but the flow of his overall look made you not care. And Indiana had a fourth guy wandering around in defensive lineman Jacob Robinson. So I guess you could say they had an unfair advantage but Robinson dressed the part, too; pinstripe shirt with a candy cane tie under a blue jacket looks pretty cool. If black or gray is part of your team’s colors, you don’t get to rely on black or gray in your suit as your only attachment to the school at an event like this. 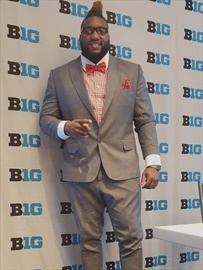 Ohio State players wore a black tie, an orange tie and a pink tie. Not even a team pin could be found. Get it together Buckeyes. I will give Ohio State this, though: Wide receiver Parris Campbell had the best shoes. Just looking at players and taking the coaches out of the equation, you’ve got to give props to Purdue’s Markus Bailey. The linebacker had what appear to be dumbbells on his tie. And it’s Purdue-colored. Well done, Markus. Lovie Smith's beard is incredible. The Illinois head coach doesn't have many wins on his resume through two years but that shouldn't detract from this. It's just awesome. Did you know Jerald Foster could sing? I didn’t know Jerald Foster could sing. Lord have mercy, Jerald Foster can sing. 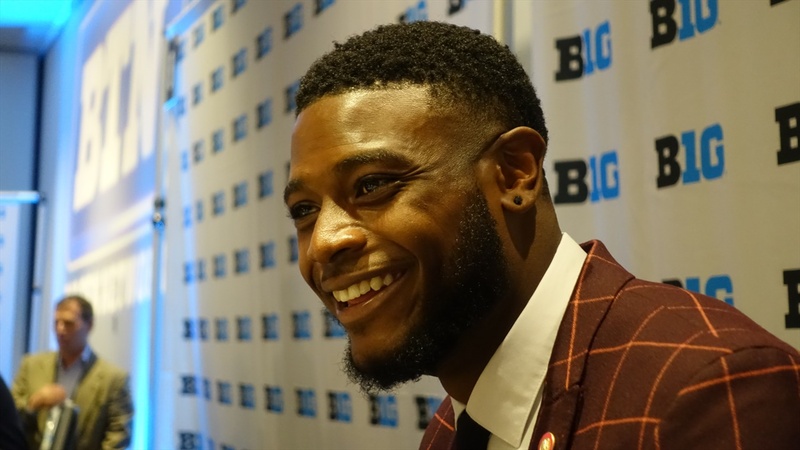 If you missed any of Hail Varsity's coverage from Big Ten Media Days, catch up on everything here.